Nigeria, a country in West Africa bordered by Benin, Chad, Cameroon, Niger, Gulf of Guinea, and the Atlantic Ocean has a total land area of 356,667 square miles and a population of over 152 million. 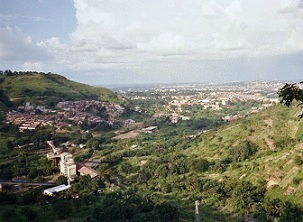 Africa’s most populous country, Nigeria is among the fastest growing economies of the world. It is among the 11 Global Growth Generator countries of the world and has a strong economic partnership with US. Its natural resources coupled with established financial, legal and communications sectors has qualified it for middle income status. The country has great mining and agriculture potential, given its underexploited mineral resources and underutilized arable land. The government is challenged with tapping tourism effectively. Other significant contributors to its economy are petroleum, manufacturing (leather, car, processed food, plastics, etc. ), and movies. However, its human rights record leaves a lot to be desired. November through May are the best time to visit country for game viewing. With its varied landscape, it is noted for its biodiversity. The notable parks are Mambilla, Gumti National Park, Cross River National Park, Yankari Game Reserve, and Kainji Lake National Park. Other attractions include the beautiful beaches Owu Falls, Eleko, Lekki, Calabar Beach, Tarkwa, and Coconut Beach. Nigerian cuisine is rich, spicy, and flavorful – a wide spectrum of enjoyable dishes abound. The dishes can be based on rice, beans, or meat. Yams, cassava and corn are also used extensively. Nigeria Bradt Travel Guide 978-1841622392 $22 Best guide book for travelers to Nigeria! Part I is a detailed traveler’s information covering 90 pages. Part II has sections on Lagos, Southwestern Nigeria, Southeastern Nigeria, Central Nigeria, East and Northeast Nigeria, and Northern Nigeria. My Nigeria: Five Decades of Independence 978-0230620230 $18 An immensely readable account of the history of Nigeria presented in a personal manner. Nigeria Travel Map 978-1553413523 $12 1:6,000,000 Scale. The first stamps of Nigeria were a set of twelve stamps released between 1914 and 1927 that were King George V (KGV) key types in different colors and denominations. The set (Scott #1 to #12) is rare and sought after and catalogs for around $320 mint and around $420 used. A short set with a subset of the colors and denominations were also issued. That set (Scott #13 to #17) catalogs for around $70 mint and around $250 used. KGV key types along with certain common design types formed the primary stamp issues of Nigeria during the period till 1935. The first original issues of Nigeria were a set of twelve stamps released on February 1, 1936 showing local scenes. The set (Scott #38 to #49) catalogs for around $325 MNH and around the same for used. The designs show a portrait of KGV along with Wharf at Apapa, picking cacao pods, dredging for tin, timber, fishing village, ginning cotton, Minaret at Habe, Fulani cattle, Victoria-Buea Road, oil palms, View of Niger at Jebba, and Nigerian Canoe. The Niger area was united as the Colony and Protectorate of Nigeria in 1914. It gained independence from the United Kingdom on October 1, 1960. A set of twelve stamps released on September 1, 1953 showing local scenes. The set (Scott #80 to #91) catalogs for around $50 MNH and around $10 for used. The designs show Manilla Currency, Bornu Horseman, Peanuts at Kano City, mining tin, Jebba Bridge over Niger River, cocoa industry, Olokun Head, logging, Victoria Harbor, loading palm oil, Goats and Fulani Cattle, Lagos Waterfront, and 19th and 20th centuries contrast. A set of fourteen stamps released between 1965 and 1966 showing Fauna. The set (Scott #184 to #197) catalogs for around $60 MNH and around $30 used. The designs show lioness and cubs, elephant family, splendid sunbird, weaverbirds, cheetah, leopard and cubs, saddle-billed storks, gray parrots, kingfishers, crowned cranes, antelopes, giraffes, hippopotami, and buffalos. The designer’s name Maurice Fievet appears on the set at the right or left. A set of four stamps released on October 24, 1984 in the Rare Bird Species theme. The set (Scott #462 to #465) catalogs for around $8 MNH or used. The designs show pin-tailed whydah, spur-winged plover, red bishop, and francolin. A set of three stamps released on November 30, 1998 to mark the eighth anniversary of Military Co-operation Organization (ECOMOG). The set (Scott #688 to #690) catalogs for around $7 MNH or used. The designs show Silhouette of Ship, Flag colors of Gambia, Ghana, Guinea, Mali, Nigeria, Senegal, Sierra Leone, Flag colors of Gambia, Ghana, Nigeria, Guinea, Mali, Senegal, Sierra Leone, Niger, Ivory Coast, Benin, and Burkina Faso. The first coins of Nigeria were British Protectorate of Nigeria Pound Sterling Coinage Bronze Pennies released in 1959. The issues had very high mintage upwards of 50M and catalogs for around a dollar for UNC. Proofs have a mintage of a few thousands but are valued remarkably low at a few dollars. Prior to this, coinage of British West Africa along with certain tokens were used. British Colony Decimal Coinage (100 Kobos = 1 Niara) was introduced in 1973 with the issue of Bronze Kobos. Those also have very high mintage (over 100M) and are valued at upwards of $2 for UNC. Nigeria has also issued a few commemorative gold proofs over the years starting with the 1000 Naira 1.401 troy ounce issue of 1994 to mark 100 years of banking in Nigeria. The issue has very low mintage (100) and is valued at a sizable premium over bullion value. Coins $2 and up Common UNC Kobos from the 1970s onward starts around $2. Recent Year sets start around $10. Proof Sets from the 1950s onward in Original Presentation Box go into the 100s. Paper Money $2 and up Common UNC Nairas starts around $2. Recent UNC Replacements, High Value UNCs, etc starts around $10. Recent Bundles, Year Sets, etc start around $50. Poundage Era Large Notes in XF, Rare Poundage Era Specimens, 1000-piece bundles, etc go well into the 100s and 1000s. Gemstones $2 and up Genuine 1ct Tourmalines start around $2. Brass Bead Hair Decorations, Livestock Bells, etc start around $30. Agate stone beads, Dark Green Emerald in the 1ct range, 7-layer Chevron Beads, etc go into the 100s. Huge (over 10ct) VVS Tourmalines can go into the $1000 range. Antiques $10 and up 19th century maps, lost wax cast brass beads, bells, etc start around $10. Yoruba Diviners Belts start around $50. Yoruba Figurines, Ibibio Masks, Eket Masks etc go into the 100s. Chamba Spirit Masks, Ekoi Two Faced Crest Masks, Ogoni Bronze Figures etc go into the 1000s. Art $10 and up 19th century antique prints start around $10. Carved Wood Tribal Art Figures start around $50. Authentic Tribal Oil Paintings go into the 100s.